Grasses perform two functions in the garden. Lawn grasses, those that you sit on, have picnics on, play soccer on, are known as running or turf grasses. They have underground rhizomes that travel around and create a carpet. The other kind of grass is known as Ornamental, or Bunch grass. They grow much like a shrub, they sprout out of one general area and although some can get quite large and run a little they aren't nearly as aggressive as the real runners. These grasses combine nicely in the garden with other shrubs and perennials. 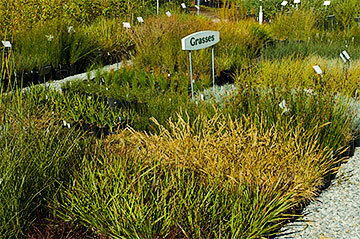 Grasses have several advantages over perennials. Most look good year round, especially in the winter when other things tend to look shabby. Most are virtually disease free and need little care and provide valuable habitat and food for a variety of creatures. They offer form and foliage color in the garden, a soothing contrast to other perennials, and movement with each breeze. Several of these grasses do reseed and we've tried to note this in their descriptions. We have discontinued growing Stipa tenuissima because of its reseeding problems and potential as an escaped exotic and are keeping our eye on Stipa ichu.